Jesus taught his followers that it is easier for a camel to go through the eye of a needle than for a rich man to enter heaven. Yet by the fall of Rome, the church was becoming rich beyond measure. 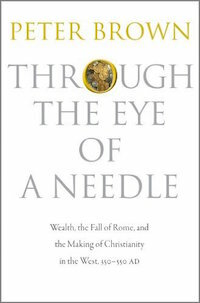 Through the Eye of a Needle is a sweeping intellectual and social history of the vexing problem of wealth in Christianity in the waning days of the Roman Empire, written by the world's foremost scholar of late antiquity. Peter Brown examines the rise of the church through the lens of money and the challenges it posed to an institution that espoused the virtue of poverty and called avarice the root of all evil. Drawing on the writings of major Christian thinkers such as Augustine, Ambrose, and Jerome, Brown examines the controversies and changing attitudes toward money caused by the influx of new wealth into church coffers, and describes the spectacular acts of divestment by rich donors and their growing influence in an empire beset with crisis. He shows how the use of wealth for the care of the poor competed with older forms of philanthropy deeply rooted in the Roman world, and sheds light on the ordinary people who gave away their money in hopes of treasure in heaven. Through the Eye of a Needle challenges the widely held notion that Christianity's growing wealth sapped Rome of its ability to resist the barbarian invasions, and offers a fresh perspective on the social history of the church in late antiquity.